High On The Weed Of Self-Indulgence. An Orchestra conductor does not face the crowd. 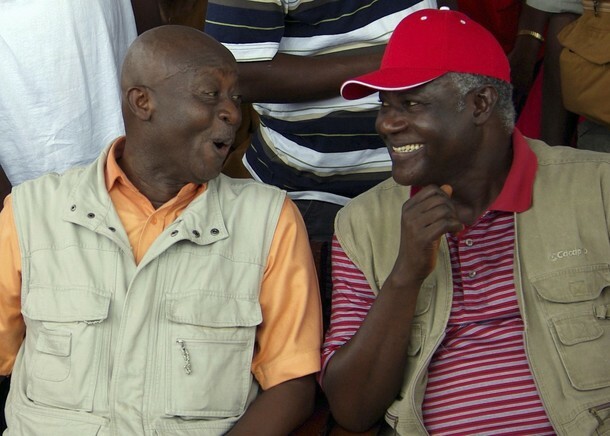 President Koroma’s insistence on doing just that, more than leading the country in getting our national priorities right and championing pivotal points instead of meaningless platitudes in the nation’s repair, is to my mind, the blot in his determined bid to be the best leader Sierra Leone has ever had. For example, how can a government which is hell bent on foisting on the present and unborn generations, a debt that will enslave the nation for a damn long time, be considered progressive and an agent of change; even when the people are united in their opposition to the fanciful project for which the debt is being incurred? While the citizens who are frustrated by poor growth, high inflation and corruption, lack of social amenities etc. clamour for zero tolerance to poverty, why are they getting the epicentre of abrasive leadership? His failure to clearly identify the nation’s pressing challenges and outline his clear programmes for tackling them, complete with a timeline – especially post-Ebola, is indeed laughable in retrospect and a reflection of the paucity of ideas on how to effectively engage the masses of this country and get them to buy into the truly tough decisions that need to be taken, if we are indeed determined to push for a far better country than what currently obtains. Loyalty comes before objectivity in this land, and that will have to be reversed one way or another. Let’s stop placing allegiance over fairness, otherwise ours is going to become a perpetual journey to the Promised Land, always sought, but will never be achieved. It is our overtly reclusiveness and resignation to circumstances that have dragged us thus far. Why should I therefore join the chorus of those worshipping at the shrine of hypocritical patriotism and nationalism or join the politics-of-the-pocket; where mostly ‘semi or educated illiterate moneybags-behind-the-throne’, chart the course of our existence. If all of us have to focus only on the ‘achievements’ of a governance from which much was/is expected, we might as well ask Dracula to babysit. My candid opinion though is that it is incumbent on us to stand up for what we believe is right and not dive under the bed, at the mention of APC or Ernest Koroma. It is our aloofness that has tied us in knots and forced us to end up surrendering our portion of the political terrain and strategic initiative and thinking, to the politicians. But I believe that we now have to be more than fretting spectators. Anyway, I wonder whether those who are taking pot shots at me with their mob hysteria, actually understand what genuine social change is all about as well as the philosophical underpinnings and dimensions of change; as against the current sterile footpaths to greatness. For true change, we must refuse to continue to be divided, fractured, narrow-minded and fearful along ethnic, religious, social, economic and political lines. None of that is the colour of unity. None of that is the podium for change. None of that is the leverage for a new society. Candidly, whatever are perceived as achievements is the least expected of whoever and whichever party is in power.It is the fundamental duty of any administration to provide the necessary wherewithal for the improvement of its society and the people. To provide the basic essentials, without prompting. To take adequate care of the majority of its people. That doesn’t sound like too much to me. Unfortunately, what the insightful, though down-trodden people of our beloved country see, is the rather brazen and bizarre manner the government believes in keeping the country inthe state existing before the war; contrary to their desire for a return to the path of civilisation which sadly enough, once existed within our shores. This yearning which has been emasculated is not because of today, but for a better tomorrow and the renaissance of our dear country. Our compatriots genuinely want a change in ideology and a genuine direction towards a thriving state and a prosperous nation. The cry of some of us therefore represents that desired change. Not recognising this important point is to me, the tragedy of the lack of our collective sense of history. Which is why it never occurs to those who want me to sing praises that our national failure is the sum total of all our little acts of dishonesty and hypocrisy as well as our impunity and deliberate falsehood, in the desperate pursuit of cult status. We engage in the hollow rituals of celebrating ‘perfection and selfless service’. But we know, in the inner recesses of our minds, that it’s all a fluke because our politicians with fat hunchbacks of corruption have not done justice to national imagination; or they ought to do better. The kind of change that lifts majority out of poverty and changes the face of our society is what we all crave. For any leader that can achieve that, that would be a legacy. Real legacy. That would be immortality. I mean when you do something that the world does not necessarily have to attach your name to; things that they will forget your name; yet take to their hearts, something that a leader has done that lives long after him for the betterment of humanity. Not symbols to the glory of money. As far as I know, the appearance of change does not necessarily mean that real change has taken place. Change is an intrinsic feature of reality. It follows that for genuine change to occur in a socio-political environment, certain fundamentals in the society must undergo transformation. It is obvious that those who see my noisy “gospel of change’ as a dis-service were either not around when Sierra Leone was a ‘garden of Eden’ or are just plain mischievous due to their corrupt mentality. I am not a prophet of doom, neither am I anti-APC or anti-Koroma. But I can beat my chest and claim to be one interested in a better tomorrow, not only for generations unborn, but for the twilight of my own life. So, I can categorically say without fear or favour, that what we have largely being assailed with, have been voices of ethnic and political sentiments, voices of emotion and voices of inequality in a field of cosmetic provisions. At least for now. But this is eight years into the life of this administration and maybe, just maybe, this is why the rebuke stings more than necessary. For those responding to the outmoded principle of change without well-structured plan for its concrete actualisation, it is unfortunate that more sober considerations are not being made regarding the route of our journey from independence. The downward transition gives the true picture and reasons of our failures; especially the current state in which agents of destruction have brutalised the majority, leaving them bereaved, dislocated and disorientated. Did I hear you say they are not at fault? So, let me ask: outside the cosmetics, and even conceding to this regime’s touted dividends of our democracy, with its numerous challenges and imperfections, in what ways have the essential fundamentals of our national life and society changed for the better since 2007, given the pledge of restoration to the glory days of pre-civil war? Can we truly say that we have a system that works for every citizen to activate his talents and achieve his fullest potential? Looking at the landscape of our socio-economic and even political environment and development, can anyone say that we have been able to achieve a balance in the welfare of the majority of the people or ensured the greatest good of the greatest number, whilst yet safeguarding the interest of the minority? Do me a favour; any meaningful programme of change in a society must be preceded by careful analysis of the institutions that play important roles in that society.The truth is that while some of us can live with certain absurdities since there seems to be no other choice, I would ask cheerleaders to spare a thought for the millions who are out there in the cold of our savage world, hungry and battered, through no fault of theirs; but governance failure. Because indeed, there are several Sierra Leoneans carrying a placard of hopelessness; a placard of atomic aches and of infinitesimal pains as well as a burden of desperation. After eight years of longing, the gnashing of their teeth, coupled with the tears in their eyes; as poverty and diseases as well as other disasters violate and blight their existence, is a stab into the very heart and conscience of our nation. Except for those who want to be mischievous, the living conditions of the most vulnerable have not really improved any significantly and if anything, the aftermath of the recent Ebola and flood, indicate that in some cases, their situation worsened; principally as a result of the inherent absence of those things that make life a wee bit easy for the less fortunate. Over half a decade and several millions of dollars down the line, our electricity is still suffering from epilepsy while the nation is surrounded everywhere by water but no decent one to drink in several homes. But for Ebola, the health sector is devoid of the essential saving grace; as our hospitals are still mere consulting clinics; while getting around still costs an arm and a leg for the poor. And even though our economy was touted as ‘upwardly mobile’, truth is that the real sector recorded very little if any growth at all. True and progressive change is effectively steeped in values that not only signpost the desired transition. Its morality is all about producing the right kinds of overall consequences which in this case is to bring the greatest benefits to the greatest number of the citizens of Sierra Leone. I am not bothered about those who suffer from diarrhoea of the mouth; or those who are unable to convince me of the reason I should understand that road constructions are true evidence of good governance as well as those who feel that power is not about achievements, but propaganda. One thing that the apparatus of government has so far succeeded, is to ensure that the gullible among us can no longer differentiate between ‘change’ and ‘progress’ or ‘positive transformation’; without realising that the objective processes which lead to change are dependent on the blending of several variables and that positive or progressive change is quite different from mere change. So to those with bloated sense of self-righteous indignation and messianic pretensions, there is change, but not in the direction that would bolster the confidence of discerning minds or the people who truly cry out for change. Those who do not want to be backseat drivers in the journey for lasting transformation, see the government’s belligerence, as an emphatic validation of the political philosophy that has kept us down under. How can we progress if the government pretends as if the desired march to a new nation is akin to switching the lamp on and off? We are in a mess because we have failed to reform and restructure the political process and urgently create an enabling environment to diversify the economy in a 21st century world. Which is why we cannot deny those who clamour for a new country. It is our abundant duty and right to propagate our desire for a new, enlightened and united nation as an integrated part of a civilised world. Despite our future being revealed to the recent backdrop of harrowing wails, indications are that it would be easier for the proverbial camel to pass through the eye of a needle than for the current class of politicians to eschew selfishness and work genuinely hard to uplift the poor, the unemployed and the downtrodden. Every plan seems to be lofty in goals and long in fruition; which suggests that, even in the aftermath of the devastation of the very epicentre of our society where the majority live, the government has no coordinated strategy and action plan for the transformative change those on the lower rung of the ladder are yearning for. The handling and complaint of the resettlement of the flood victims is a testimony of this warp interpretation of the emerging socio-economic and political phenomenon. It is puzzling and distressing that amidst the national malaise, those in power and some so-called leaders of thought believe in feeding us with only what detracts from the truth. It is important to realise that the kind of change Sierra Leone needs now is not mere replacement of the ruling party by another, especially with the opposition not worth its salt; neither is it change in the individuals running the executive and legislative arms of government. The change required very urgently is an intellectual and moral revolution among members of the ruling elite, which could lead to appropriate behaviour modification necessary for responsible and responsive leadership. Unfortunately for us, the APC cannot give what it does not have; the party is incapable of changing the warped mindset of its members, because it is dominated by politicians mainly motivated by the desire for power, easy wealth and the love of luxury and sensuous pleasure. Sierra Leone has all the potentials for greatness, if only the shallow and dim-wit interlopers and pillagers at the helm will just give nature a chance to manifest God’s blessings on our nation. The only thing that is permanent in life is CHANGE no matter how long it takes. So let us believe it will happen in our life time, with or without the clogs in the wheel of true progress. Amen.